You program a client that needs to upload a file to the server. What are the options? You should probably look into System.Net namespace where you can either program at WebRequest/WebResponse level or make use of one of the convenient methods on the WebClient class. 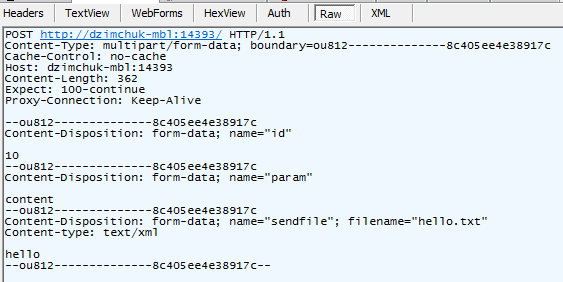 The 1st approach is described here and WebClient provides a bunch methods with self-explaining names: UploadData, UploadFile, UploadString and UploadValues. There are also asynchronous versions of the methods as well as overloads to send data over FTP. However, .NET doesn’t provide an out-of-the-box solution when you need to upload a file together with accompanying metadata. The metadata can be anything and is usually presented as name/value pairs, that is exactly what WebClient.UploadValues is supposed to do. And it does, but it doesn’t allow to send some binary array (a file) along with metadata. Not really what we’re looking for. We want to send our stuff as multipart/form-data so that we could send dictionary values as well as binary content of a file in one request as just separate parts. Yep, the request is not properly formatted. You’re going to get away with it with IIS and .NET stack but it’s likely to fail on other servers like Tomcat, for example. The solution to both of these problems is found in this article and there is a handy file uploader class written by Gregory Prentice. By default it sets the content type of the uploaded file to text/xml but if you need to upload a binary file you can specify ‘binary’ for the FileContentType property. You can find a slightly brushed up version of MultipartForm class below.